In this paper, we tested the accuracy of the point-intercept method for measuring species relative abundances in plant communities and calculating functional diversity indices. This method of botanical survey was first introduced 80 years ago by Levy & Madden (1933) and is still commonly used in community ecology with the advantages of being non-destructive and somewhat less subjective than other visual methods. It consists in systematically introducing a fine pin vertically in the vegetation layer along a regular grid (e.g. a quadrat), and counting the number of contacts of the pin with live plant organs at each point of the grid. The number of contacts per species is used as a proxy for above-ground biomass. One of our expectations was that, in functionally diverse communities composed of very different growth forms (e.g. tussock grasses mixed with small shrubs), the method would be biased by over- or under-representing certain plant architectures. We show that, despite a slight bias for different growth forms, the method gives consistently accurate predictions of species relative biomass in highly diverse Mediterranean rangeland communities. 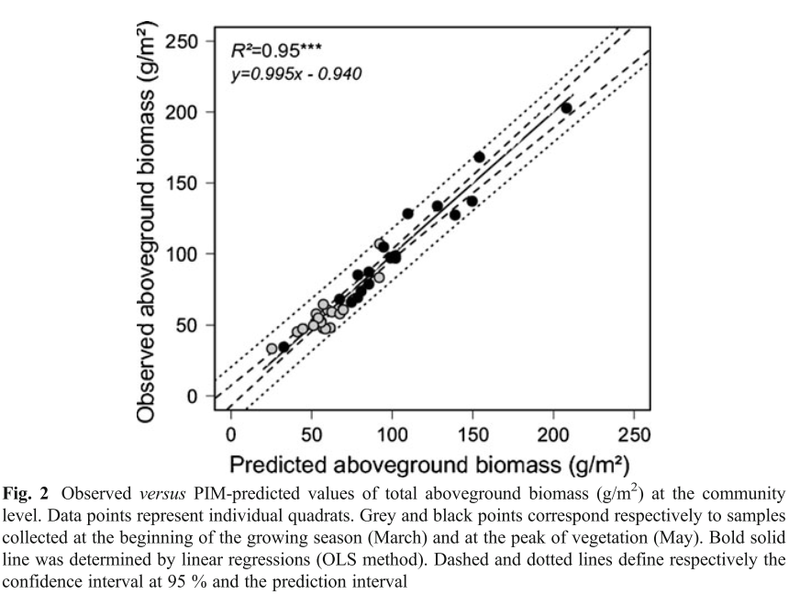 Moreover, we show that growth form biases can easily and accurately be accounted for by simple calibrations, allowing for an accurate prediction of absolute biomass in these grasslands. All in all, a reliable method, highly recommended and not as time-consuming as it might seem!